Imagine the surprise when Elizabeth Blum Savetsky and Rhoda Bernstein ran into each other in New York City! 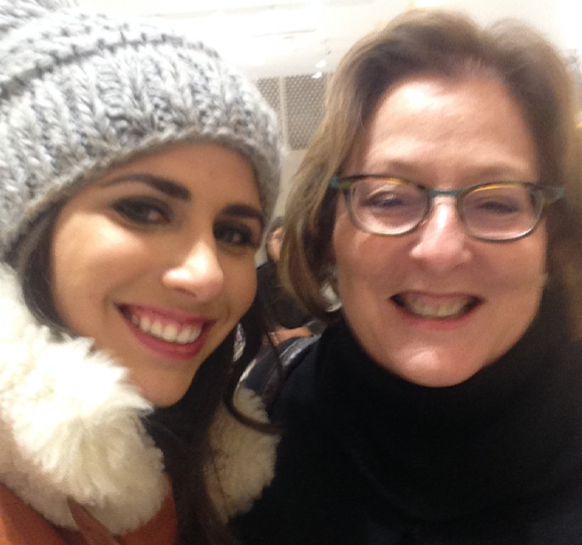 The chance encounter happened Tuesday night, Dec. 9, when Rhoda was in the Big Apple for a Hadassah event at the Rebecca Minkoff store, where a percentage of sales benefited The Hadassah Foundation. Elizabeth was covering the benefit as a New York fashion blogger, as part of her ExcessoriesExpert.com blog. A potluck dairy dinner will be served at 6:30 p.m. so please bring a dairy dish to share and bring your favorite Chanukah cookies for dessert! Families will have the chance to test their knowledge as they compete against each other in the annual Happy Hannu-quiz! There will be prizes! Contact Thressa at the Beth Shalom office by phone at 817-860-5548, by email at info@bethshalom.org, or visit www.bethshalom.org for more information and to make a reservation. Congregation Beth Shalom is located at 1210 Thannisch Drive Arlington, TZ 76011. We all know Dec. 25 wouldn’t be complete without a good movie. Mosey over to Congregation Ahavath Sholom for the next installment of its Showtimes Film Series and catch “The Frisco Kid.” It’s Gene Wilder at his funniest with Harrison Ford as his straight man. The movie starts at 3:30 p.m. Admission is free and all are welcome. Hanukkah Sameach to all the TJP readers.